Tired of the typical wine pairing dinner that seems to inundate your event calendar? Ready to hop into a change of pace? 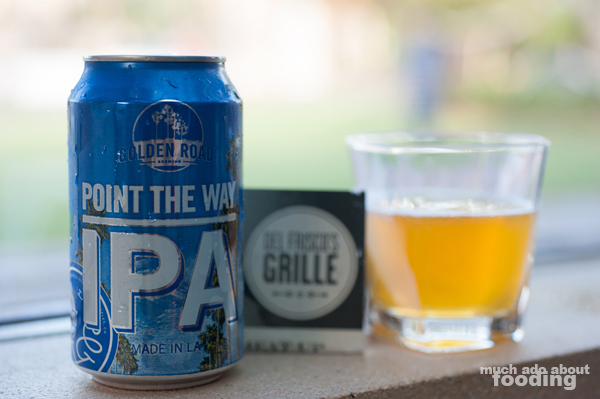 How about a beer pairing? With the influx of craft breweries and craft beer enthusiasts, it was only a matter of time before beer found its way onto the dinner table, pair to complementary dishes. 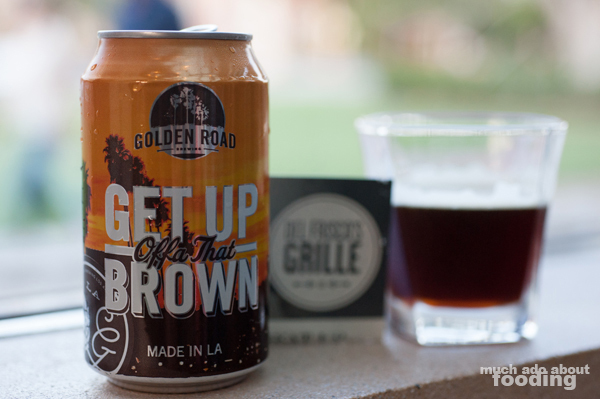 Del Frisco's Grille in Irvine picked up on this trend fairly quickly and started hosting four-course beer pairing dinners in March of this year, featuring a single brewery at a time and building an impressive menu to accompany each flavor profile. 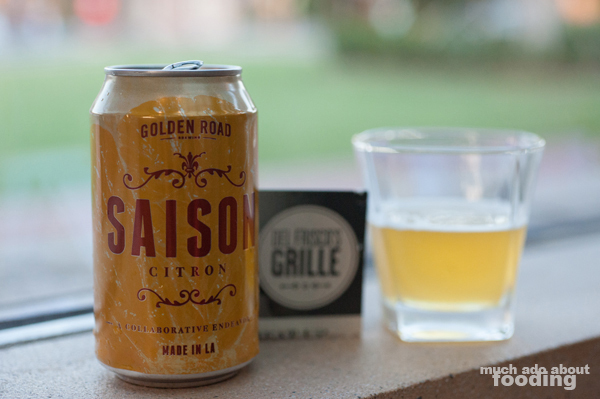 I was invited to join many other curious folks for June's beer dinner (they take place once a month) which would showcase local Golden Road Brewery and Executive Chef Sarah Daniels' take on their notes; the whole lot of us were in for quite the treat that night, and for a mere $35 per person each time, the experience was a steal! 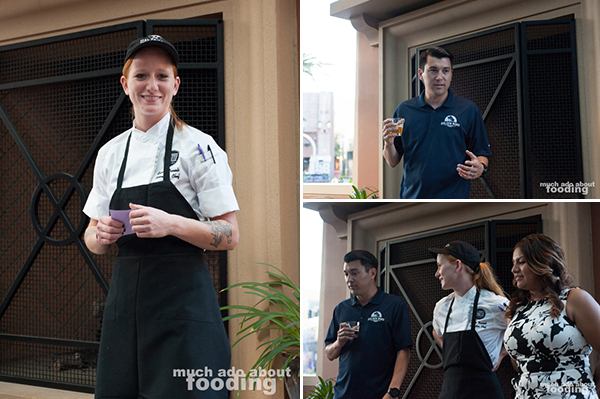 Not only do guests to these monthly dinners get to experience four different beers paired next to four robust and flavorful dishes but they also get the honor of hearing why Chef Daniels made the pairings as well as hear from the brewers. 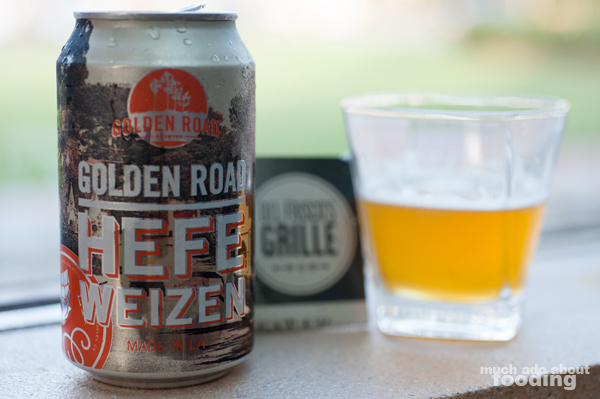 That evening, we started with Del Frisco's Roasted Golden Beets & Local Strawberry Salad (goat cheese and prosciutto atop arugula with a tarragon and mint vinaigrette) paired with Golden Road's Hefewiezen. 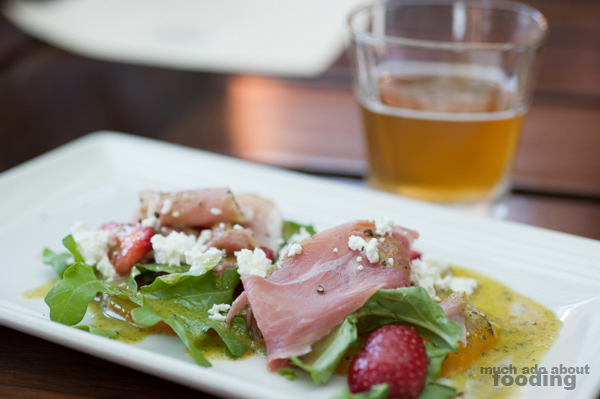 The salad possessed a beautiful balance of various tastes - saltiness from the prosciutto, bitterness from the arugula, sweetness from the beets and strawberries, and acid from the vinaigrette - which let it shine in its personality while still matching the subtler wheat beer's slight sweet and bitter notes. Both were bright and light, making it a great start to what soon coalesced into a very filling meal. 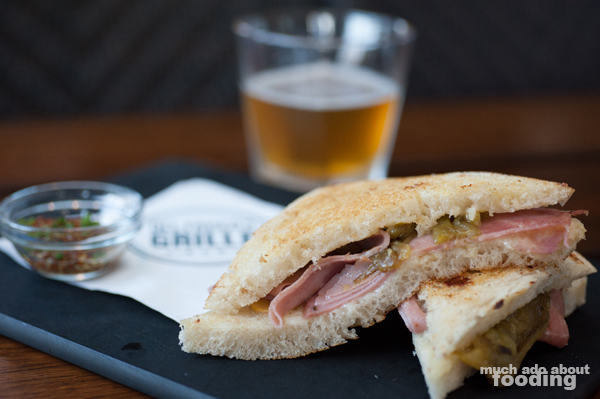 The second course gave us the assumption that we'd be having a small bite but instead, a full Grilled Panini (mortadella, taleggio cheese, and charred Anaheim peppers) arrived upon a board, piping hot and paired with Golden Road's signature Point the Way IPA. This session IPA was not nearly as hoppy as other IPAs may be which gave it more leeway to complement a dish. The panini with its creamy taleggio cheese that consumed all other ingredients in its melted state was a mouthful of savory and certainly a grown-up version of the ham and cheese we loved as children. It got all over the place since it started to grease out of the bread but who cares when cheese is so good? Surprisingly, the third course was not a wimpy portion either - their Hudson Valley Duck Breast Confit with sauteed broccoli rabe featured a full dinner-worthy sized piece of duck and a hearty glass of Get Up Offa That Brown. 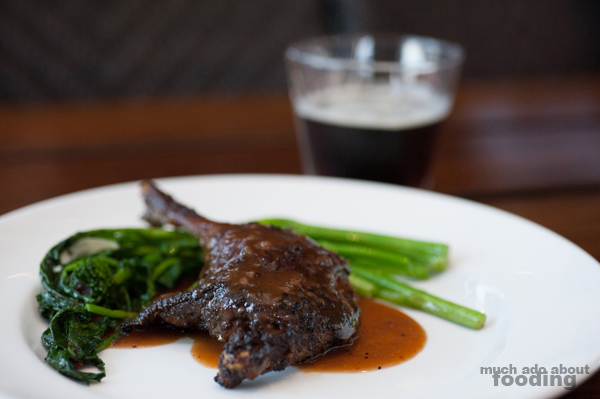 Fall off the bone tender, the duck alone would have made the meal worth it as its dark meat was neither gamey nor dry. Full of juices aside from the external liquids, this duck breast had a smoky and slightly caramelized flavor to it that paired quite well with the smoky, toasty malt of the brown ale. They went hand in hand nicely and were probably the best paired of the night. 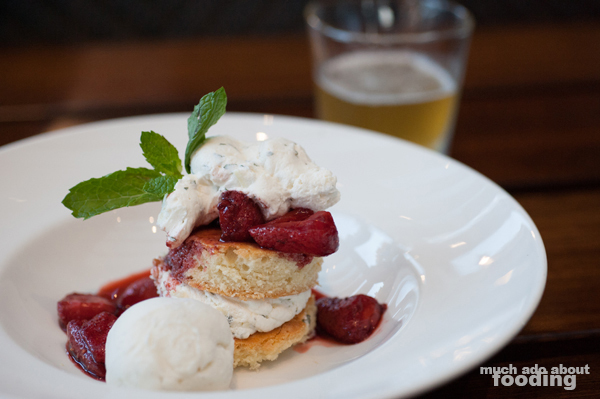 To end the evening, we all indulged in Chef Daniels' Strawberry Shortcake next to a scoop of vanilla ice cream and paired with Golden Road Brewery's limited release Saison Citron. The dessert was one to rave about, and I would go back to the restaurant specifically for this. 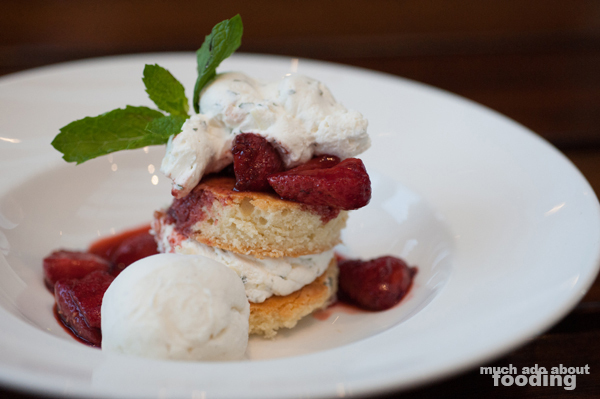 The shortcake was fluffy and matched very well against the sweet strawberries and cooling ice cream. It did not sit heavy on the mouth or in the stomach and never once veered into the danger zone of being too sweet. The saison seemed like a fair idea on paper though but was not the best pairing for this course. It was the shortcake that stole the show here. Get in on that! Seating is limited to the first 40 guests so make sure to call and reserve your seat. Del Frisco's Grille Irvine is located at Irvine Spectrum and can be reached by calling 949.341.0376. If you do make it out, please let me know so I can vicariously live through you! Ciders sound like the perfect summer treat.